The purest "kelp" iodine supplement available, just pure Seagreens® wild seaweed with no extracts or processing agents of any kind. Seaweed nutritional products at their best! The purest possible source of 'kelp' iodine, particularly useful to vegetarian and vegan diets. One daily capsule provides twice the RDA. 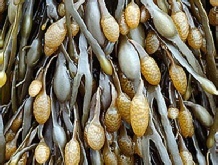 Each incredible nutrient rich capsule contains a single wild brown wrack seaweed called Ascophyllum Nodosum.It is the finest source of stable chelated iodine in Nature, rich in polysaccharides and contains small amounts of virtually every important nutrient. Nature knows best so Seagreens® don't tamper with the seaweed used in their nutritional products. They believe health is more important than convenience in processing so you won't find any cellulose and calcium fillers. There's no silica, magnesium stearate or stearic acid in the natural health products which the body cannot digest. - just pure seaweed micronised into a dry powder and encased in a vegetable capsule. Quite simply it is the finest source of stable, chelated iodine and a comprehensive balance of pure natural vitamins, minerals and vital nutrients as Nature intended. WHERE DOES SEAGREENS® COME FROM? seaweed population or the marine environment. It provides employment for the local work force and profits help support a variety of charitable activities. WHY IS SEAGREENS ® 'KELP' IODINE BETTER THAN THAT FROM OTHER IODINE FOOD SOURCES? Iodine is an essential micronutrient vital to our health and well being. nutrients and modern processing methods reduce them still further. allergies, faddy diets or personal preference. The iodine in Seagreens® is naturally bound to protein ions and easily metabolised. It remains stable as it travels through our body and is unbound as and when the body needs it. In our thyroid where most of our iodine is stored, this vital food is indispensable to thyroid gland function. Iodine is an essential ingredient for the control of normal growth and development, immunity, fertility, metabolism,and weight control. Many medical problems are the result of thyroid gland problems, and once the thyroid malfunctions it affects all the other organs. Significant health benefits accrue from regular daily use of seaweed over several months or even years. However, some 'kelp' seaweed products contain an excessive amount of iodine which could possibly be detrimental to health. Seagreens® natural health products are entirely compatible with other vitamin and mineral supplements and medicines and are endorsed and used by professional bodies.